In this photo released by China's official Xinhua news agency, China's first moon orbiter Chang'e 1 lifts off from the launch pad at the Xichang Satellite Launch Center in southwest China's Sichuan province, on Wednesday October 24, 2007. BEIJING(AP) - Over a few short months, Japan, China, and India will all have lunarprobes orbiting the moon, sparking talk of a new space race in Asia. China, for one, takes exception at that characterization. On Thursday, atop official in its secretive military-backed lunarexplorer program defendedthe probe launched last week as an innovation that is part of a future wave ofcooperation, not competition, in outer space. China's launch ofthe Chang'e 1 satellite put in motion anambitious space explorationplan, and came just weeks after rival Japan launchedits own moon probe. India plans to send its own lunar probe into space in April. The three missionsrepresent a new wave of lunar exploration following those begun in the Cold Warby the United States and former Soviet Union, and another bout in the 1990sthat saw Japan and Western Europe joining the club. James Oberg, a space consultant in Houston, said thecurrent glut of lunar missions is less of a space race and more a matter of those countries developing newtechnologies at similar rates. All three have lately developed more powerfulbooster rockets, along with experience with payloads gleaned from launchingcommercial satellites, said Oberg, a veteran of 22 years at NASA MissionControl. However, he added that suchmissions do offer tangible benefits for a country's business and reputation. "Doing 'moon probes'advertises a country's technological level and that's good for high-tech exports,and for validating the threat-level of its high-tech weapons,'' Oberg said inrecent comments to The Associated Press. Oberg likened the Chineseprobe, named after a mythical Chinese goddess who flew to the moon Similar, tothe orbiting U.S. moon explorers "Clementine'' and "Prospector''launched in the 1990s. In Beijing, Pei told reporters all was well with the satellite, whichis due to move into lunar capture orbit Monday, when it will allow itself to becaught by the moon's gravity. "All the systems onboard are currently in excellent condition and the spacecraft is on theexpected trajectory,'' said Pei, who is alsospokesman for the China National SpaceAdministration - China's version of NASA. The lunar mission addsdepth to a Chinese space programthat has sent astronauts orbiting around the Earth twice in the past four yearsand is a source of great national pride. Pei dwelt extensively on the technicalaspects of the lunar mission at a news conference that illustrated a growingopenness within the spaceprogram. Foreign observers werepresent at the satellite's Oct. 24 launch from the Xichangsite in the southwestern province of Sichuan, Peisaid. He said data gathered during the yearlong mission would be shared withscientists from other nations. China sent its firstsatellite into Earth orbit in the 1970s, but the space program only seriously took off in the 1980s, growing apacewith the country's booming economy. In 2003, China became onlythe third country in the world after the United States and Russia to putits own astronauts into space. But China also alarmed theinternational community in January when it blasted an oldsatellite into oblivion with a land-based anti-satellite missile. Pei dodged a question about theanti-satellite weapon, but gave the budget for the engineering stage of thelunar program as $187 million. Carried into space by a Long March 3A rocket, the Chang'e 1 satellite is expected to transmit its first photoback to China in late November. It will surveythe lunar surface using stereo radar and other tools as a precursor to aplanned landing on the moon's surface in 2012 and a recoverable mission by2020. Pei said China was being careful not totravel territory already covered by the spaceprograms of Russia, the U.S., Japan and the European Space Agency. 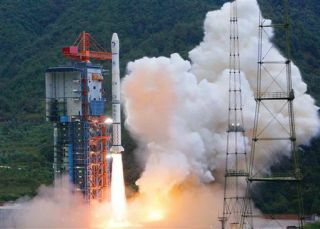 He said that by launchingthe probe, China was playing to its science and technology strengths, whilelaying the groundwork for future innovations and benefiting the country'seconomic and social development _ a reference to the Communist Party's use ofthe space program to drum uppatriotism and loyalty. "China's lunar programgot off to a relatively late start, but we hope to ... try to do something thatno one has done before,'' Pei said. "We're fully confidentthat alongside the progress in our science and technology, our lunar and deep space exploration programs willadvance rapidly from strength to strength,'' he said.